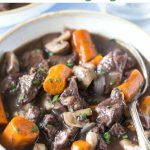 Pressure Cooker Beef Bourguignon is a very easy weeknight meal that you can whip up in about 30 minutes in your pressure cooker! 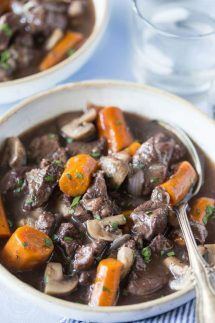 My version of Instant Pot Beef Bourguignon is already gluten free and I’ve included a couple of substitutions so that you can make it Paleo if you prefer. Where does Beef Bourguignon come from? 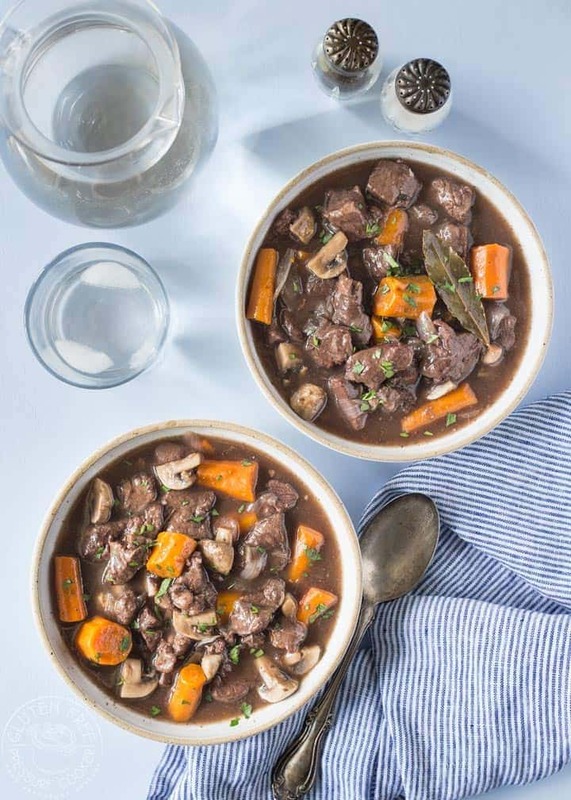 Beef Bourguignon, or le boeuf bourguignon, hails from the beautiful Burgundy region of France. It’s a simple beef stew where the meat is braised in the red wine and cooked with onions, mushrooms and a variety of other vegetables depending on the specific recipe. It’s a good example of ‘peasant cooking’ that’s evolved over time to become popular and trendy. In fact, it’s the sort of dish you might expect to find on the menu of a fancy restaurant, although it’s really easy to make at home. Whatever wine you choose, please, PLEASE don’t ever use the cooking wine you find in the grocery store next to the vinegar, it will ruin your recipe and is a poor choice for this recipe, and any recipe actually! That sort of ‘Cooking Wine’ has added salt and it tastes dreadful. A good rule of thumb is that if the wine doesn’t taste nice to drink, then you shouldn’t use it to cook with. I have the full recipe with ingredients and instructions in the recipe card at the end of the post, here are some simple step by step photos and directions that will help you. Turn on the saute function in your pressure cooker, add a little oil quickly cook the bacon pieces, remove them, and then saute the beef. You may need to do it in batches depending on the size of your pressure cooker. As soon as the meat is browned a little on all sides, add the carrots, onions and garlic and bacon. Then add the red wine and the beef broth, bay leaves, thyme and seasonings. Now shut the lid and make sure the vent is set to sealing, and set it on manual at high pressure for 12 minutes. While it’s cooking mix your starch of choice with a little cold beef broth. Once it’s cooked and the buzzer sounds, you can let it NPR (Natural Pressure Release) for 10-12 minutes. Then you can carefully release the rest of the pressure. Add the starch mixture and mushrooms to the pot and stir well, then turn on the saute function to cook the mushrooms and allow the sauce to thicken, this will just take a few minutes. 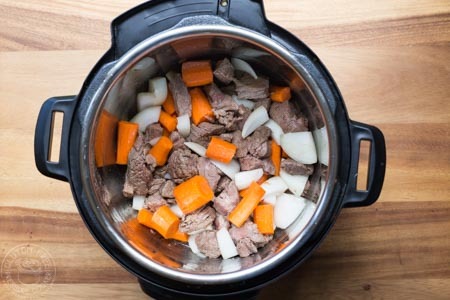 A really rich hearty French beef stew that's so easy to make at home in your pressure cooker! Adapted from Noshtastic. 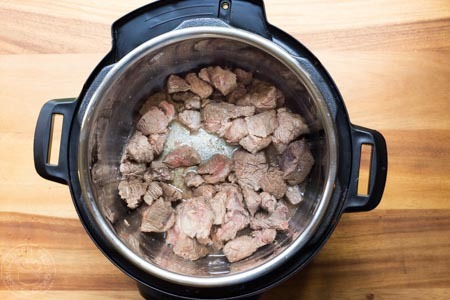 Start by cooking the bacon in a little olive oil in the inner pot by turning on the saute function on your electric pressure cooker, and adjust it to the medium heat option. Don't wait for the display to say 'hot', add oil right away and brown the meat on both sides then turn off the saute function. When the bacon is cooked remove it and set aside. Then, brown the beef pieces and add a little more oil if you need to. Lock the lid, turn the steam release vent to 'sealing' and using the manual setting, adjust it to cook for 12 minutes at High Pressure. When the cook time time is up, allow the unit to reduce pressure on its own without opening the steam release vent (Natural Release) for at least 10 minutes. 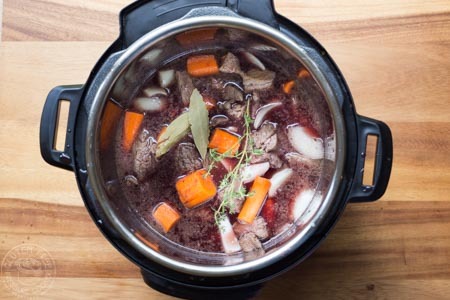 Mix 2 Tbsp cornstarch, or arrowroot or tapioca starch for paleo, with about 1-2 Tbsp cold beef broth and add to the pot and mix well, now add the mushrooms. Turn on the saute function to allow the sauce to thicken and the mushrooms to cook, this will take only a few minutes. If it's not thick enough for you, simply add more cornstarch as before. mix in the chopped parsley just before serving. There are several options available on Amazon that would be paleo compliant such as this Kettle and Fire Bone Broth, Bone Broth Powder, or LonoLife Grass Fed Beef Bone Broth. I am allergic to mushrooms. . Do you have any replacement suggestions? You could just add more carrots, baby potatoes, or perhaps some large chunks of sweet potato or another root vegetable that you like. We made this for dinner last night and it was delicious, thank you for the recipe! Thanks Morven, I’m so glad you like it! I’ve been looking for a good pressure cooker version of this recipe for a while and tried this one yesterday. I like the gravy thick so I added extra cornstarch and it worked perfectly, thanks again! yes, it’s super easy to adjust the gravy the way you like it, thanks for letting me know you enjoyed it! Oh my goodness, I had to buy a bottle of wine to make this. Of course, we drank the rest with our dinner! It (the dinner) was delicious. After three bites, my husband told me to print off extra copies of the recipe so we will never lose it. He’s downstairs having the left overs for lunch! Is this cooking time correct? I feel like the beef needs to cook more to soften! Hi Heather, I think it’s plenty time for small pieces of chuck roast beef, I like my meat to be just tender and not overcooked or I think it loses flavor and can become stringy. You can cook it longer if you prefer. Hi Sheena, I haven’t made this yet but I’ve read that you cannot pressure cook alcohol. Would it work to add the wine while finishing sauteing the meat as this would cook out the alcohol? You can cook safely with the wine in this recipe, I think the (potential) issue is with alcohol vapor from spirits from people making vanilla extract and things like that, but that’s not an issue here.